In my opinion the most overlooked job out there is that of a pre-school teacher. You will have grade school and high school teachers, college professors and bosses who will teach you a multitude of fascinating things. But really, pre-school teachers give you the basic tools to deal with all of that from day one. Pre-school teachers teach you how to share, keep your hands to yourself, speak kindly to others, not to push and not to stick your fingers in other people’s food. All important things to remember in the class room or the boardroom. It takes a special kind of person to teach our children these valuable life lessons while still nurturing their spirit and developing brains. Emma and Sarah, owners of Sunshine Cove Preschool, are two of those special people. When I first met Emma and Sarah they both struck me as two of the warmest, kindest caregivers I had ever met. The first thing that I noticed about Sarah was her voice. Calm and soothing and kind. My mom would say that it was like butter. A true reflection of her character. Emma’s smile could light up even the dreariest of Deep Cove rainy days and even the most standoffish child would melt from one of her hugs. But don’t let those characteristics fool you. These ladies are not pushovers. They are both certified Early Childhood Educators from Capilano University and are firm on what is acceptable behavior in pre school (and life) and what is not. Smacking your buddy over the head with a book because you don’t like their opinion is not acceptable. In preschool or in life apparently. Emma and Sarah met a few years ago working for a daycare that my daughter attended. They discovered they had similar teaching styles and quickly became great friends. 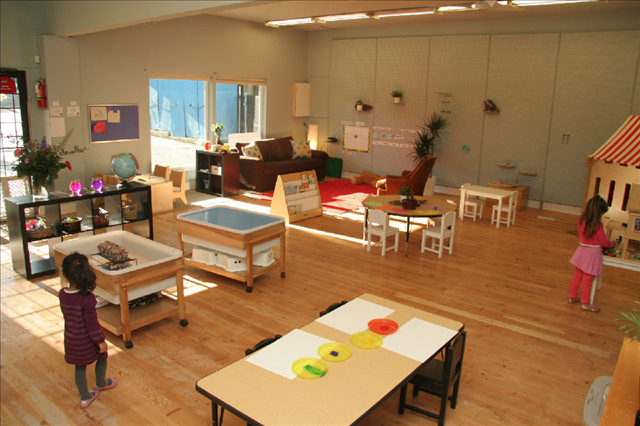 When the daycare closed they decided to take a huge leap and open their own preschool. Sunshine Cove Preschool was born. The decision to move from employee to business owner has been exciting, stressful and nerve racking all at the same time, they say. It was a tough start with neither of them having much business experience and balancing the work as a child care worker with the administration of the business side has been an eye opener. They both admit to being a bit naive when it came to the business side. They were lucky enough, however, to have a great former employer who has guided them through the rough patches. Each credits the other with getting them through the last couple of years. The school itself is amazing. It’s an older warehouse building that they have renovated. It is everything a preschool should be. Bright, colorful, warm, welcoming, fun. Nature is a huge part of their program and it is everywhere. Kids can create, paint, build and get messy or plop themselves down in a comfortable chair and look at any number of books and puzzles. Their program is a bit different from the other preschools in the area in that they offer a four hour session. This, they feel, gives the kids time to really settle in each day and allows Emma and Sarah time to establish good routines and structures and really teach rather than just watch. It also gives parents a decent stretch of time to work or relax. The toddler program runs Tuesday and Thursday from 8:30-11:00 and the preschool age kids can come Monday through Thursday for two to four days. Friday is a drop in day for registered students. I feel that I would be remiss if I didn’t mention how good Sarah and Emma are with the kids they care for. They are constantly looking for interesting and new education techniques to use when dealing with hyperactivity and aggression – two behavioral traits they run in to quite often. The flip side of that is nurturing the kids who maybe don’t need as much direction. Emma told me about one little boy that would happily play at the light table for 45 minutes on his own. The challenge, she said, comes in recognizing him and his fascination and not always focusing our time and energy on kids who need our attention. It’s important to connect with him and say “Hey, you seem to really be enjoying that table. Tell me about it?” Don’t you wish some of your past employers had done this with your work? Being new business owners has taken an emotional toll on both Emma and Sarah over the past two years, but they wouldn’t have it any other way and wouldn’t have done it with anybody else. Their passion for teaching and nurturing kids is so inspiring to me and to be able to take that passion and make it your life’s work must be so satisfying. I can think of no better place to send a preschooler than Sunshine Cove Preschool. It would give me comfort knowing that they are in Sarah and Emma’s care and that they will learn those valuable life lessons that will carry them in to the big world with confidence. The Best Thing in Life is knowing how to behave. And to not stick your fingers in other peoples food.